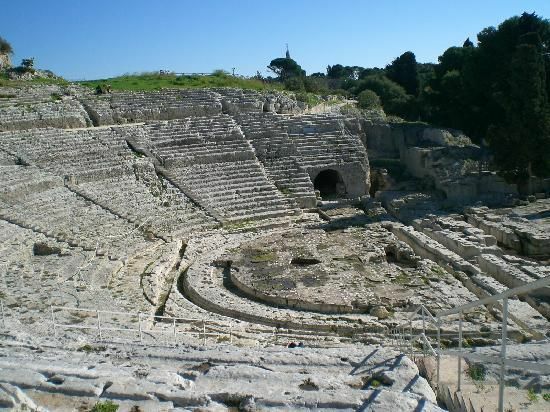 Syracuse is an ancient city of Greek origin, dating back to the 28th century BC. The city sits in the south-east of the island of Sicily on the gulf of Syracuse by the Ionian Sea. Syracuse population stands at about 125,00 inhabitants in the central area. The Siracusans speak the Sicilian language. Syracuse’s weather is a typical Mediterranean climate: winters are mild and wet and summers are warm to hot and dry. Traces witnessing a history that dates back to the period of Mycenaean Greece can be found in the villages of Stentinello, Ognina, Plemmirio, Matrensa, Cozzo Pantano and Thapsos. Corinthian and Tenean settlers founded Syracuse (Συρακοῦσαι transliterated from the Ancient Greek is Syrakousai) about the year 734 BC (At present Syracuse is twin city of Corinth due to its Greek origin). Their leader named it Sirako due to a salt marsh situated near the foundation. The island of Ortygia was the most important part of the city. The land proved fertile and the primitive inhabitants accepted their newcomers. The city flourished and it remained as a leading city around the coast of the Mediterranean Sea. In the following centuries other colonies Akrai, Kasmenai, Akillai Helorus and Kamarina were built nearby. As centuries passed by Syracuse became the most beautiful in Magna Grecia, according to Cicero, and a powerful city whose influence spread over it. The descendant of the privileged forefathers of the city, the Gamoroi held power until the lower class, the Killichiroi took it. The help of Gelo the leader of Gela restored the Gamoroi to power. However Gelo turned the real ruler of the city where he ordered to build a new theatre where Aeschylus, Ario of Metimma, Eumelos of Corinth and Sappho won a place on stage. The constinuously growing power of Syracuse was not accepted by the Carthaginians in western Sicily. Victory favoured Gelo who erected a temple in memory of the battle against Hamilcar. Hiero, Gelo’s heir, was immortalized by Simonides of Ceos, Bacchylides and Pindar in their poems. Thrasybulos (467 BC) established the first democratic regime on the island. The city expanded its power over the island and other islands such as Corsica and Elba. In 5th century it sided with Sparta to fight against Athens. Part of 4th century with Dionysus the Elder in power, the struggle with Cartage intersperced with periods of expansion, construction of walls and a fortress, and founding of new cities and the conquest of Calabria on the mainland. Dionysius was celebrated for fostering art in the city which was visited by Plato in those times. Years of despotic ruling, internal struggles, democratic ruling and external struggles against Cartage followed Dionysus’s death.. When Hiero II came to power peace and quiet let the a city grow in all aspects for 50 years. It was considered at the time one of the most famous capitals of Antiquity. Lex Hhieronica was his work that was later taken by the Romans for their administration of the island. During his ruling the theatre was extended and Archimedes the philosopher created some innovative military weapons that helped Syracuse resist the Romans laying siege to the city. The following ruler sided with Cartage and the Romans laid siege to the city that lasted three years. When finally the Romans entered the city, Archimedes was one of the heavy unfortunate losses. The city remained capital of the Roman government in Sicily and a strategic trading port between eastern and western empire. However, it began to lose its splendour. Paul of Tarsus and Saint Marziano, the first bishop of Syracuse, turn Syracuse in a main religious centre. The enormous catacombs follow the Roman ones in size. Vandals took power when the Roman Empire collapsed. However, the city was recaptured by the Byzantines in 535 and was chosen by Constans II from 663 to 668 as his seat and main city of the Sicilian church. In 878 the Muslims seized power and made Palermo the capital. Important catholic buildings were used as mosques and their style was changed to follow the Islamic one. However, the city kept its intensive economic, cultural and artistic activities. The Byzantine general George Maniaces took the city and sent Saint Lucy’s remains to Constantinople ( She was born in Syracuse and for centuries has been its patron saint whose celebration is held on 13th December). The castle nestled on Cape of Ortygia was called after him. About 50 years later the Normans led by Roger I of Sicily and his son seized the city, recovered it and returned the cathedral and churches to the Christian church. Later on different crowns took the power of the city: Henry VI of Swavia, then Genoese rulers for a short period and Frederick II who ordered to build Castello Maniace, the Bishops\' Palace and the Bellomo Palace. After his death feudal anarchy took the city. At the end of 13th century in the struggle between the house of Anjou and Aragon, Syracuse supported the Spanish later was rewarded with privileges when they seize power. 1542 and 1693 were terrible years for Syracuse. Earthquakes shook the city and a plague decimated the population in 1729. 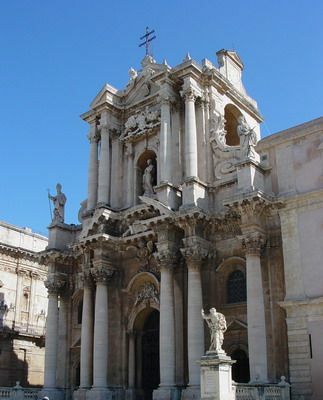 After the 17th century disastrous years Syracuse and the cities on Val di Noto were rebuilt following the baroque style which produced an extensive change in the city’s style. In 1837 the cholera outbreak stirred up towards animosity against the Bourbons and the city rebelled against them. The government thought that the revolt had been suppressed. However, due to the events of 1848 it was obvious that the independence movement was still part of people’s dreams. When Italy was unified in 1865 Syracuse became the capital of the province, a title that had lost after the events of 1837. In the 70s the city witnessed many changes as to infrastructure: the demolition of the walls, the construction of a bridge from Ortygia to the mainland and the building of a railway. During the World War II Syracuse was heavily bombed by the Allied in 1943. The allied invaded Sicily, an operation named Operation Husky, the city was easily taken in July 1943 by the British who established their base for the Royal Navy at the port. The Commonwealth war graves in the west of the city where 1000 men rest reminds Siracusani of those terrible days. The whole city of Syracuse and the Necropolis of Pantalica which is situated in the province of Syracuse have been included on the list of World Heritage Sites by UNESCO since 2005. The list intends to revalue and preserve outstanding natural and cultural sites for the posterity. The sites are submitted to a committee for approval which in the case of Syracuse argued that the priceless monuments and archaeological sites in the city reveal the architecture of different cultures and periods: Greek, Roman, and baroque. Another reason stated by the committee was the fact that ancient Syracuse has been part of events, ideas and literary works that have made turning points in the history of humanity. BY BUS: there are buses connecting running from catania, Noto, Modica, Ragusa And Gela. 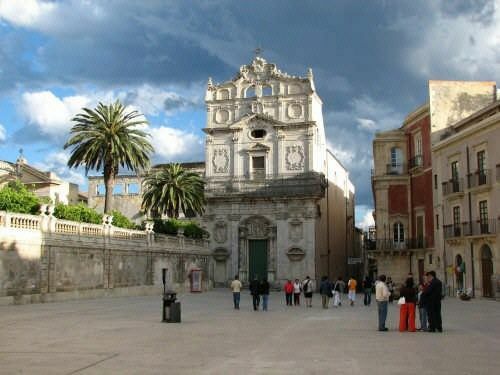 BY PLANE: Catania is the closest airport with a direct bus service to Syracuse. The second option is the airport in Palermo. BY TRAIN: it is on the line running from Messina, Taormina and Catania along the coast. There are direct trains from Rome. From Palermo, you will have to change at Messina. From the mainland, take the ferry to Messina. BY FERRY: there are ferries to Palermo from Naples, Livorno,Genoa and ferries to Catania from Naples.